On Sunday this past weekend, I had plans to meet my friend Martin (Check out his Instagram here) for breakfast and then go back to my place for some morning Warhammer 40k. We are participating in a doubles tournament again this December, and after getting 4th at the last one a couple months ago are hoping to improve on that standing. I’ll be running my Death Guard and Martin his Golden Armada (Necrons). So after stuffing ourselves on some glorious chicken and waffles from the local diner, we waddled back to the car to sit and think about our life choices. It was at this moment I remembered there was an auction taking place at one of our local hobby shops today. No idea what might show up but assumed for sure we might find a couple deals on some nice Warhammer stuff. So we quickly made the choice to at least stop by for a quick walk through and see what was there. A quick synth filled drive and 20 minute wait in the car continuing to digest while we waited for the store to open and then we were there. First impressions: Disappointment. 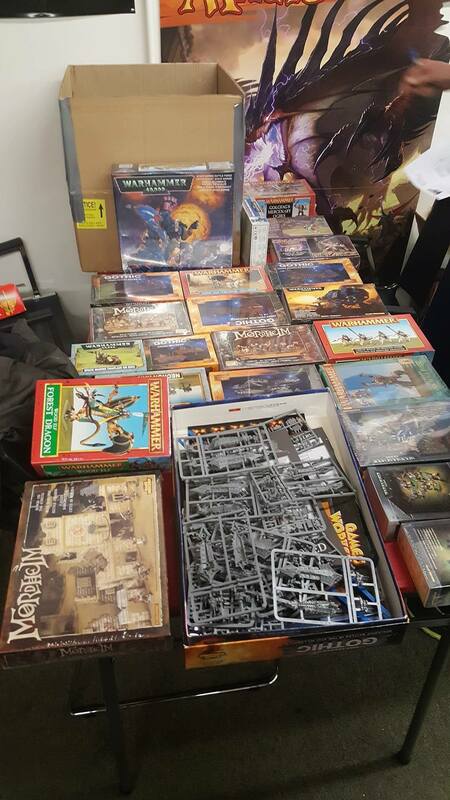 Most were just army lots at higher prices than I would ever want to pay, broken and badly painted models for armies I have no interest in, and a few game systems I don’t even have time to consider. About 5min in we were considering heading out but as some were still bringing in items we thought we should wait to see what else might turn up. It’s a good thing we waited. In comes a man with 3 huge boxes. As he starts to pull out the contents my jaw drops. Crowds begin to form around the tables he has begun to dominate for himself and his loot. 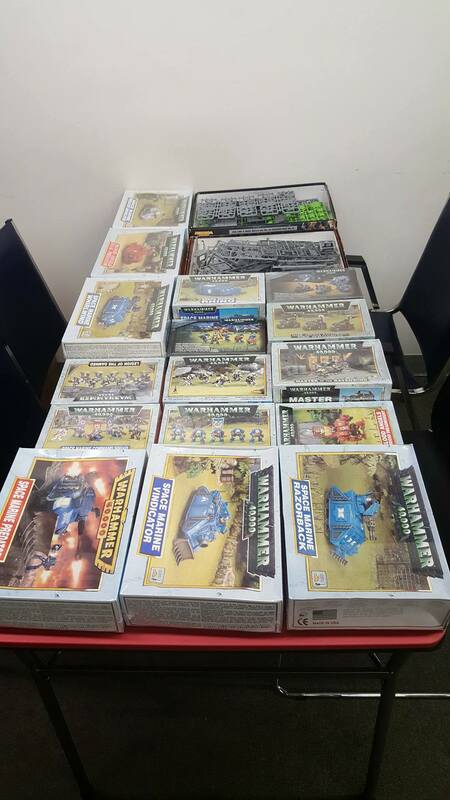 Box after box of Oldhammer fill the tables…rhinos, Battlefleet Gothic, tactical squads, scouts, marine tanks of every caliber, Mordheim gangs, fantasy blisters and dragons….endless. It turns out, back around 2000 he won a contest that netted him 1 of every item GW had in production at that time. You only imagine how much that must have been. It would seem all these things had been sitting in boxes for years just taking up space. This wasn’t all of it but I forgot to take more pictures, he was still sorting at this point. As you can see a lot of mint in box items here. We both knew now we would have to stay until the end of the auction (about 3 hours) so we could grab what we wanted hopefully. The guy selling this started every bid at $1 it should be said. This was a silent auction so you just wrote name / bid on paper beside each item. Increments of about 50 cents to a dollar minimum. Martin right off the bat spiked a box of “Necron Raiders” (original Necron Warriors) with a $30 bid. Needless to say he won that one :). I went around to all the tanks and through $15 bids on each. I also was texting with the guys of Victoria Heresy (Check out the Instagram page here) who wanted me to bid on all the Battlefleet Gothic…so I threw bids on all that for them! 3 hours slowly, nervously passed. I also threw bids on a small LOTR collection and an X-Wing Death Star gaming mat. I won those both for 10 bucks in the end. The final 10 minutes was a nail biting race between pages as I had to keep rebidding to keep my lead. I wasn’t letting those tanks go. Bid on one, outbid on another, run back to that one an rebid, find out I was outbid on 2 more. Over and over. Small 50 cent or 1 dollar increments as I run around this table in a war of wills with others. When the final whistle was blown I sat back and realized I was now the owner of a lot of new tanks….. In the end I got outbid on all the Battlefleet Gothic stuff for my buddies except for the main starter box which I got for $49 (a screaming deal I am told). They were still stoked with that win. I ended up paying about $112 for my haul which was a great deal. All those kits are brand new still shrink wrapped in their cases. “So after stuffing ourselves on some glorious chicken and waffles from the local diner, we waddled back to the car to sit and think about our life choices. “ this quote made me chuckle! 🤣 you got an amazing haul from that auction! The tanks are awesome! Really miss those old kits. Is till have that codex at my parents…time to reclaim it! The second edition one also has a nice spread but a little bit smaller…lol. I think its a company sized (with extras). A sweet haul there, mate!